We believe legacy-building isn’t just for an elite few—it’s for everyone. Through the charitable arm of WealthCounsel, WealthCounsel Stands, we hope to empower local communities to create their own legacies by creating a lasting impact that extends beyond document drafting. Kids in Need Foundation - In the US today, more than 16 million children live in poverty and are often at an academic disadvantage, lacking the support and resources needed to succeed in school. In order to help low-income children have a better chance at academic success and break the cycle of poverty, the Kids in Need Foundation provides free school supplies to students in some of the most challenged communities across the country—including those who have faced devastation from natural disasters and storms. Through their three main programs, Kids in Need Foundation has delivered school supplies to 200,000 teachers and 6.2 million students. Legal Aid at Work - is a non-profit legal services organization that have been helping low-income families and workers in the California area. Through their various programs, Legal Aid at Work works to strengthen civil and employment rights of low-wage workers. Their work focuses on wage protections, racial equality, domestic violence and sexual assault, gender equity and LGBT rights, unemployment benefits, and disability rights. In addition to providing free legal information at their legal help clinics and helplines, Legal Aid at Work also brings class and individual actions, limited representations, and impact litigation for workers in California and across the country. Girls Who Code - a non-profit dedicated to closing the gender gap in technology. As of today, less than 1 in 5 computer science graduates are women. Compared to 1995 where 37% of computer scientists were women, today it’s only 24%. To combat this growing gap and ensure that women don’t miss out on the fastest growing job market, Girls Who Code is reaching out to girls all over the nation and connecting them with learning programs and support communities to help girls build successful careers in tech. As of today, Girls Who Code has served 90,000 girls all over the nation, and now boasts of having over 5,000 college-aged alumni. Their outreach to historically underrepresented groups—particularly girls who are Black, Latino, or from low-income households—is paying off, too. Black and Latina alumni are choosing to major in computer science or related fields at a rate 16 times the national average. The Road Home - is a social services agency that believes in the power of community to help individuals and families overcome homelessness in Utah. Due to a continued increase in housing prices, many families across the nation and in Utah are experiencing acute and persistent homelessness. By providing multiple services, such as shelter, emergency services, case management, and housing, The Road Home’s mission is to “help individuals step out of homelessness and back into our community.” Along with providing emergency, life-saving shelter 365 days a year, they also help individuals and identify and overcome the barriers that cause them to become and persist in homelessness. In fiscal year 2017, The Road Home helped 10,852 individuals and 764 families overcome homelessness. We're excited to stand with these charities just as we stand with our members. 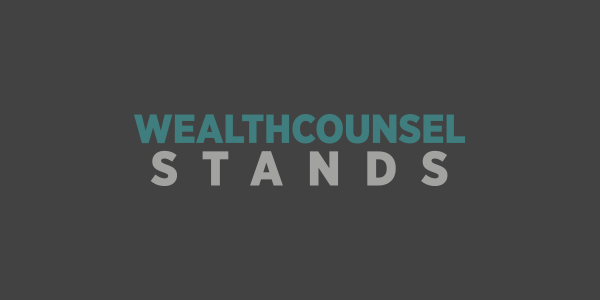 Learn more about WealthCounsel Stands and our philanthropic work here.